Wright-Way Rescue unveiled its new Morton Grove location to the public during an open house last weekend. The no-kill shelter’s founder says she hopes to have the new site up and running by late April. The 13,000 square-foot building on the corner of Lincoln Avenue and Mason Avenue still needs to be retrofitted to house a cage-less adoption center, veterinary clinic, community education and outreach center, retail store, administrative space and a grooming facility. Wright-Way lost the use of the building it leased at 7136 W. Touhy Ave. in Niles after a driver lost control of a school bus and rammed into it. While no one on the bus or in the building was injured after the crash, Wright-Way’s Niles location was made uninhabitable by the crash. Since then, Wright-Way Rescue has continued to place adoptable animals in homes using a skeleton staff from its temporary location in Des Plaines while also raising funds to move into a new permanent home. After courting different suburbs, the shelter decided to pursue a location in Morton Grove and had their permits approved by the village board last December. Back in 2002 Anderson was a student at Southern Illinois University at Carbondale. It was around then that Anderson began trying to find homes for animals to keep them from being euthanized. “I was an animal science major and I rescued the first dogs out of my dorm room,” said Anderson. While in school she had gone to a nearby animal control facility and wound up adopting dogs that were going to be put down. Currently Wright-Way has a reputation of placing more dogs in adoptive “forever homes” than any other no-kill shelter in Illinois using a budget that’s almost 10 percent of similarly sized organizations. The shelter has a second facility in southern Illinois the visits rural animal control facilities and pulls out adoptable dogs and cats that are at risk of being put to sleep. These animals are then readied for adoption before being transported to Wright-Way’s facilities in northern Illinois. On average the shelter says it’s been able to save 4,000 animals a year from being put down thanks to their unique adoption program. Once construction is complete, the new Morton Grove location will be about three times the size of the old Niles location, said Anderson. To this end Wright-Way is working to raise $1.5 million towards completing renovations and the ongoing care of animals in their facilities. During the open house the shelter also announced a naming opportunities program for the adoption center. 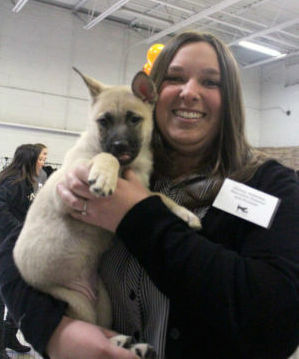 “We’re trying to have our adopters have a piece of our legacy,” said Lisa Aiken, the shelter’s director of development. She said donors can have the adoption center, veterinary clinic, volunteer lockers or even the facility’s courtyard named after them. For more information contact Aiken at 847-400-4836 or lisa.aiken@wright-wayrescue.org.